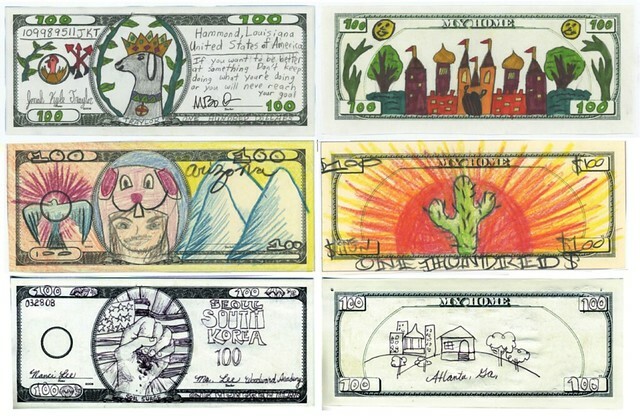 Fundreds, hand-drawn interpretations of hundred dollar bills, submitted to Operation Paydirt. Photo Credit: Operation Paydirt. Mel Chin, prolific conceptual and visual artist, is known for bridging the distinct disciplines of art and science, and using creative expression to illuminate issues of social and environmental injustice. On Wednesday Feb 11th, CoLab’s Empathetic Aesthetics Program invited the 2014-2016 Mel King Community Fellow to engage a group of urban planning, architecture and art students and practitioners in a conversation about the role of experimental and participatory art in urban transformation. Much of the discussion was centered around his ongoing community-engaged project, Operation Paydirt, which is the focus of his Fellowship at MIT. Initiated in 2006, Operation Paydirt invites children, families and communities to imagine, express and actualize a future free of childhood lead poisoning. Central to Operation Paydirt is the Fundred Dollar Bill Project, a creative campaign advancing public education, community engagement and the use of arts to cultivate activism. Fundreds – original, hand-drawn interpretations of hundred dollar bills – have been contributed by nearly half a million community members to demonstrate the power and value of community expression for policy makers and the general public. Working closely with CoLab and DUSP, Mel intends to continue to build and deliver capacity for activism around this important issue and apply this creativity towards policy change at the national level. Operation Paydirt grew out of one of Mel’s post-Katrina visits to New Orleans, where many artists had gathered to help make meaning out of the crisis. His search to understand the scope of the disaster reconnected him with scientist Howard Mielke. Years before, Mel had conversations with the scientist about lead and soil contamination. Mielke had created a map of the city marked with red zones and numbers visualizing the extent of contamination. Chin asked what it really meant as far as people were concerned and Mielke responded that significant portions of New Orleans’ childhood population were poisoned with lead before the storm. The way Mel sees it, the expansion and evolution of the project, has been required in order to take the “poetic attachments and move them into the pragmatic.” Mel candidly shared that in order do this, he has had to both learn how to communicate with partners from other disciplines and deal with both his own and others’ delusions. He explained, “When you come up with a project there is a certain poetry to it. And there is delusion. Then you realize after the first year it is scary! Things change, people change, projects change.” As the project has grown, Mel has thought increasingly about his own role and responsibility in the effort, and the lasting impacts he would like to see. “When working on experimental projects, one important lesson is that you might need to evolve out of it,” he reflects. Determining when and how to leave, however, is not always an easy balance to strike. While committed to and pleased with the way Operation Paydirt continues to move from the poetic to the pragmatic, Mel insists that, “it is all the in-betweens that matter.” The success of Operation Paydirt can be defined by neither the initial artistic spectacle nor the delivery of Fundreds to D.C.. Its success lies in everything in-between. From the 4th grader in Idaho who learned about the dangers of lead exposure, to the Congressperson understanding the need for policy change, Operation Paydirt has already made a lasting impact by fostering empathy between those of vastly different backgrounds. Mel argued near the end of his talk that, “engagement is a process of education, and you [first] have to be sensitized.” Art has a unique role to play in this process of sensitization, shedding light on the sometimes-invisible problems we face as a society, and calling forth the creativity and voices of the community to address them. Post by Nse Umoh Esema & Allegra Williams.